Sitting on the floor gets uncomfortable for anyone! These soft spots encourage parents, grand-parents and caregivers to linger at eye level with little ones, and make a nice buffer between all bottoms and the hard floor or ground. Take a Squishy Mats to an outdoor concert, baby yoga or your older kids’ sporting events, and the whole family can gather there in comfort. 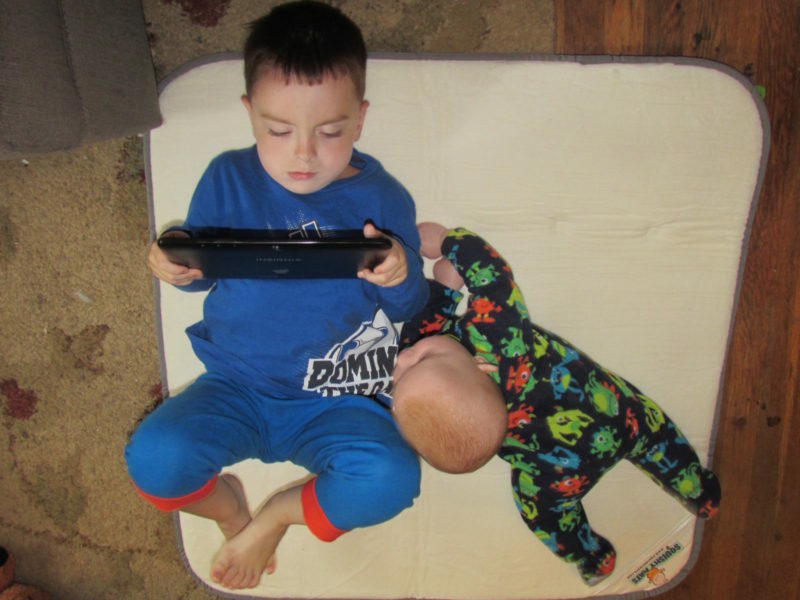 Having 2 boys in our home has sure been a different world than when it was my husband and I with just 1 little boy. Before our little William came into the world our then 3 year old informed us that they would be a team and it would be kids against adults. I firmly believe this plan is happening right before my eyes. The day that the Squishy Mat arrived we were fighting our first bout of Strep Throat. It was BAD. Jack was miserably sick and honestly I didn't even know what to do to keep them entertained but also keep Jack from doing too much before his strength came back. I opened up this mat, which was super easy and only required me opening up a velcro strap and placed it on our floor. It was AMAZING. Jack kept saying how comfortable it was and William immediately looked like he had been placed on a cloud straight from Heaven. Now, all of that aside I really thought what happened next was going to be the end of our mat so hear me out. We have a dog... one who adores our boys so much and one who thinks he should be with them 24/7. On the day the mat arrived it was rainy. I wasn't thinking much past the end of my nose that day and really was struggling with having a sick child and trying to balance blogging, house chores and exhaustion because William really wasn't sleeping well either. Said dog (named Buddy) came flying inside with muddy paws and it reminded me of one of those paper towel commercials where something spills in slow motion and no one can do anything about it. Buddy ran right to the Squishy Mat and there were muddy nasty paw prints EVERYWHERE! I knew that this mat just had to be ruined and honestly I wanted to cry. These boys loved it so much and I knew that I had my review to write and everything was just done. I went onto their website and started looking to see if I could even wash this, because as many of us Moms know, lots of children's products have strict instructions on how to wash things and it usually ends up being easier to just get another one or call it a total loss. The statement found in their faq section saved my life Your Squishy Mat is machine washable. So immediately I gathered up the ridiculously stained mat, went to my washer and tossed in a laundry pod and some of those lovely scent boosters that I use on almost everything and said a quick prayer. I set it on quick wash so that I could monitor the situation and make any changes I needed to such as adding another cycle. 37 long minutes passed. I heard the buzzer and went running. Much to my amazement the Squishy Mat was 100% clean. Prayers answered, 2 happy boys and most importantly a happy Mama!! If you are looking for a mat for your baby or toddler that can be used at home, for travel (it is coming on vacation with us in September) or even for use outdoors this is the mat for you!! Available in 2 sizes (and a changing mat) they retail from $34.95-$89.95. A must have if you are looking for a baby shower gift for a friend or family member also!